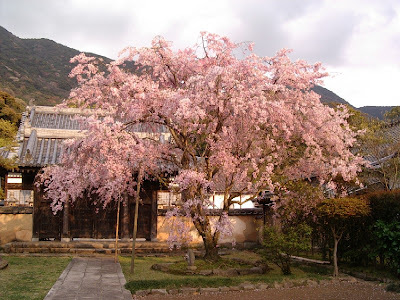 "memorial day of the old man who loved plum blossoms"
"Danrin School" Danrin-Ha 談林派(だんりんは） of Haiku. Danrin literally means "talkative forest". He was born in the Higo province 肥後国 (now Kumamoto, Kyushu) and his name was Toyoichi Nishiyama Toyoichi (西山豊一). His father was a follower of the famous Lord Kato Kiyomasa. He had the chance to go to Kyoto and study to become a Renga master there. In 1623, due to internal political problems, he became a masterless samurai. He went to Osaka to teach Renga with a more leisurely and free touch, that appealed to the taste of the merchants of Osaka. Soin had also studied therenga style of Arakida Moritake (1473-1549) . In 1647 he became the teacher of a group of poets at the Shrine Tenmangu at Osaka 大阪天満宮. 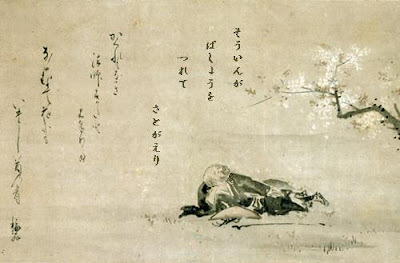 Basho met Soin around 1675. Soin joined the Shofu School of Basho for a while, but later turned back to his own style, the Danrin. haikai 俳諧(はいかい）. Teimon was a rather bookish school, relying heavily on the Japanese and Chinese classics and needed a lot of intensive study by its practitioners. “The art of haikai places fabrication before truth. Haikai is a joke within a fantasy." Shibu Uchiwa Hento 渋団扇返答 Answer to the "adstringent fan"
in answer to the lectures of the Teimon school.
. Teimon 貞門 the Teimon school . Ihara Saikaku was one of the many famous disciples of Soin. Painting by Saikaku, text by Soin. Just yesterday I watched a Japanese program about Matsuo Basho and his development as haiku poet. to start the school of Shofu style 蕉風 (from baSHO ... meaning Basho style haiku) as a new one in Edo. And Basho made a good living as a teacher of this new school, with makoto, the "truth" as one of its bases. He also promoted: Fueki Ryuko (fuueki ryuukoo), "permanence and change".
. shoomon 蕉門 Shomon, Basho's school . Bashô's encounter with the Zhuangzi was not a coincidence. It was part of the haikai poets' long time effort to make the genre a legitimate and profound poetic form. haikai, or the comic linked verse, as the word is often translated, is a popular poetic genre composed by multiple authors in an alternation of seventeen- and fourteen-syllable brief verses. When haikai reflourished during the latter half of the seventeenth century, the haikai poets faced two seemingly contradictory demands. On the one hand, they had to go beyond the limits of the classical poetic conventions in order to reach a popular audience and to distinguish haikai from the classical linked verse (renga). On the other hand, they needed intertextual structures and a shared knowledge of codified poetic vocabulary to increase the capacity of each short verse and to make the poetic dialogue possible in a group composition. The latter demand decided that haikai, though a parodic, unconventional genre of popular culture, never completely broke away from the classical tradition. Instead, haikai poets constantly looked to the past for inspiration. However, the existing classical Japanese poetic tradition could not provide all haikai needed, because haikai relied essentially upon the use of haigon, the vernacular and Chinese words that were not part of the classical poetic diction. haikai poets, then, found the Zhuangzi a useful reference. The Zhuangzi had been known in Japan since the Nara period and had the status and popularity of a classic among educated people. It was envisioned as a source of poetic essence by the haikai poets for different reasons. Before Bashô, the Danrin School, and some Teimon school poets as well, already tried to include the Zhuangzi as an authoritative source of poetic essences. To the Teimon poets, the Zhuangzi was a model text for the allegorical expression of haikai. The Danrin, on the contrary, took the bold laughter, the deliberate reversal of conventional meaning, and the unrestrained imagination of the Zhuangzi as a congenial frame of reference for their characteristic haikai approach. Bashô studied with both the Danrin and the Teimon masters, but his adaptation of the Daoist ideas in haikai achieved a much higher level. As I mentioned earlier, Bashô was able to grasp the spirit and principles of the Zhuangzi through their embodiment in Chinese poetry. Beside the themes of individual freedom such as "carefree wandering," the Zhuangzi asserts an aesthetic conviction that sees beautiful qualities in ordinary and even "low" things/beings. This makes it immediately possible to discover profound meanings in the down-to-earth topics and vernacular language, which haikai poets took as the hallmark of their poetry. Bashô also incorporated the central idea of the Zhuangzi, naturalness and spontaneity, in his compositional theory to reduce the limitation of the rigid rules of the linked verse. Therefore, Bashô was able to use the Daoist classic ingeniously to appropriate haikai's popular, unconventional nature while at the same time imbuing its vernacular language and mundane themes with high cultural values. The haikai poets' adaptation of the Zhuangzi is an important phase in haikai's evolvement so it is hard to speculate if Bashô would have achieved the same success without the influence of the Zhuangzi. Yet, we can be certain that without the Zhuangzi, Bashô's haikai as well as the entire Chinese poetic legacy would be quite different. The Keene translation (though useful) seems to miss the humour of the poem. It was too dry for my liking, and without any of the word play, or comedy. I decided to try my hand at translating them, and came up with three variations which I think are more successful at capturing the original tone of the poem. The pain in my neck. Thinking to gaze at them, I drew extremely close to the cherry blossoms, making the parting ever so painful. It's he who falls...deeply into grief. Soin...takes 11 syllables from one of Saigyo's more boring blossom-viewing poems (SKS#126) [SKS = Shinkokinshuu], and its homophone, "painful." Saigyo's 'itaku', very..., becomes Soin's 'itashi', painful. Can equal the moon tonight. 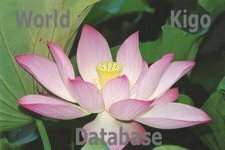 Keywords: Japanese literature, early modern Japan, haikai, poetry, Matsuo Bashô , Shômon, Kagami Shikô, Zhuangzi, Yosa Buson. In the seventeenth century, the number of haikai practitioners grew steadily, and the genre attracted an enthusiastic audience in urban and rural settings all over Japan. However, the success of haikai was problematic, as some poets equated popularization with vulgarization. Most prominent among them were Matsuo Bashô (1644–94) and his disciples, the Shômon. The Shômon competed for influence with other haikai schools, particularly those who practiced tentori (point-garnering) haikai and maekuzuke (verse-capping) whose main objective was amusement rather than literary expression. While they deplored such "popular" haikai, at the same time Shômon poets capitalized on the reputation of their school’s founder to attract students and secure their own positions within the haikai community. This panel explores how poets associated with the Shômon were active in both resisting and promoting the popularization of haikai. David Cannell examines tentori haikai and maekuzuke—often dismissed by scholars as unliterary and beneath consideration—which shed light on the value structures of the Genroku period. Peipei Qiu studies the works of Bashô disciple Kagami Shikô (1665–1731), showing how his interpretations of the Zhuangzi adapted to demands of a growing audience of haikai writer-readers in the early eighteenth century. Cheryl Crowley explores the complex relationship of Yosa Buson (1716–83) with the Shômon, arguing that though Shômon poets were useful allies in Buson’s efforts to reform haikai they also were a source of anxiety, as they represented a challenge to his carefully constructed literary identity. The use of Daoist ideas in haikai during the late seventeenth and the early eighteenth centuries was a prominent phenomenon. While presenting different interpretations, three major haikai schools of the period, the Teimon, the Danrin, and the Shômon (Bashô school), shared a conspicuous interest in using Daoist ideas to justify haikai and to construct its themes, theories, and values. The Shômon, in particular, sought inspiration in the correspondences between Daoist principles and the Chinese recluse tradition, and the leader of the school, Matsuo Bashô (1644–94), made the Zhuangzi a fundamental source of his poetry that opposed market values. After Bashô’s death, Shômon poets remained interested in Daoist sources, but they tended to shift away from the spiritual and literary values that Bashô had emphasized. Consequently, allusions to Daoist texts in Shômon writings of the post-Bashô period were often regarded as no more than catchphrases or ornaments showcasing their author’s Chinese learning. This paper takes a close look at such seemingly meaningless use of Daoist sources in the works of the productive but controversial Shômon theorist, Kagami Shikô (1665–1731). Tracing Shikô’s changing interpretations of the Zhuangzi, I examine how his view of the fundamental way of haikai gradually moves away from Bashô’s concepts that are deeply informed by Daoist ideas, and how Shikô’s replacing Daoist principles with Confucian values at the center of his haikai theory reflects an impulse to meet the taste of the public and the demands of the popularization of haikai at the time. This paper is an examination of the notions of value that structure haikai practice and discourse in the Shômon (Bashô school) and, by way of contrast, in commercialized forms such as tentori (point-garnering) haikai and maekuzuke (verse-capping). Matsuo Bashô (1644–94) and his circle of poet-disciples were powerful critics of commercial haikai, and in the past most scholars have tended to follow his lead in dismissing it as frivolous, lacking distinctive literary value, and even as an unredeemable capitulation to the market. Recent work on tentori haikai verse by scholars in Japan, however, suggests that the verdict may still be pending on the literary merit of this kind of haikai. With this in mind, my paper examines the nature of the so-called capitulation on the part of tentori and maekuzuke to uncover what insights it might yield into the value structures of the urban haikai field. In doing so, I show how structures of value—socioeconomic as well as literary—are refracted in literary practices, representations, and poetic images of the Genroku period (1688–1704). I also bring to bear on this topic an analysis of Ihara Saikaku’s (1641–93) writings on merchant culture, as Saikaku’s fascination with the fungibility of just about everything in the new commercial economy makes him an indispensable source of any consideration of value in Genroku Japan. While haikai was enormously popular in the middle of the eighteenth century, many poets felt that the genre was in a state of crisis. One factor was the dominance of tentori (point-garnering) haikai, in which people competed to see who could score the most points; another was the proliferation of factions whose leaders’ main interest was attracting the maximum number of students in order to gain the most profits. In response to this, the Back to Bashô movement, a loose affiliation of poets who called for a return to the ideals of Matsuo Bashô (1644–94), began to emerge in the 1760s. 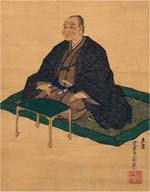 A leader of this movement was Yosa Buson (1716–83), whose Yahantei school became a center of activities aimed at resisting what its members viewed as the negative effects of the popularization of haikai. For Buson, however, the Back to Bashô movement was a source of anxiety as well as support. This was not an anxiety of influence, as Buson’s concern was not with outperforming his great poetic predecessor, who represented an important source of authority. Rather, Buson’s anxiety centered on his reception by readers, particularly his own acquaintances within the Shômon (Bashô school), who were rivals as much as they were colleagues. This paper focuses on Buson’s letters and prose works such as Shin hanatsumi (New "Flower gathering") and the Shundei kushû (Shundei verse anthology) preface to explore the anxiety surrounding his relationship with the Shômon and his efforts to establish an independent identity as a poet.